Family of the Month – The Thumalapapalli Family – Sponsored! This family has been sponsored. Thank you! To learn about other families in need of a sponsor, please visit our Sponsor A Family page. Here is the Thumalapapalli family’s story: Just imagine living in a small, damaged hut that could fall down at any time. Then, add to this picture that three generations of your family are living with you, your husband is disabled, his parents – who live with you – are HIV positive and unable to work. Imagine waking up every morning knowing that you are the only source of income for food for your two children and all the adults living with you; and that there are medical bills to pay, loan payments past due. This is the plight of Ravanamma, a small 30-year-old woman, whom we are asking you to consider sponsoring this month. You can the full story of the Thumalapapalli family here. 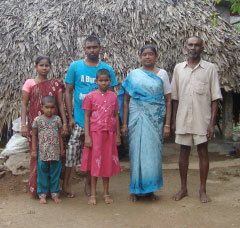 The Franciscan Family Apostolate is eager to help Ravanamma and her family. They will provide support for her to develop a dependable stream of income for the family. A willing sponsor will mean that the daughters, Prameela and Sandya Rani, will have daily meals and the strength to well in their studies and have hope for a better life. To learn more about sponsoring a family, please click here. To sponsor Ravanamma and her family, please click here.